Bomb squad experts Tuesday sifted through the debris of a blast at a Bangkok religious shrine where at least 21 people were killed and scores wounded in an unprecedented attack on the city. The hunt intensified for the bombers as shocked Thais struggled to come to terms with the scale of the carnage, which struck at dusk as worshippers and tourists thronged the streetside Erawan Shrine in the city's commercial heart. 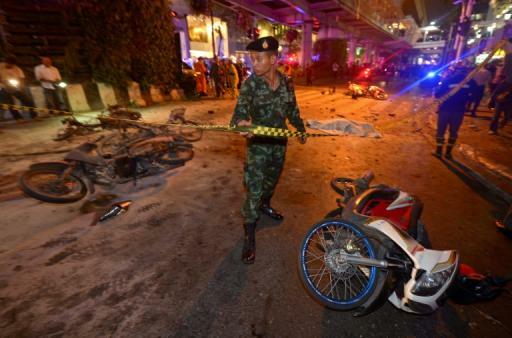 "The bomb aimed at killing as many people as possible as the shrine is crowded at around 6 to 7pm," Police spokesman Prawut Thavornsiri told AFP early Tuesday. "The death toll is now 21 with 123 wounded... of the dead 14 were killed at blast site," he said, adding the bomb probably contained three kilogrammes of explosives. Authorities have said the blast targeted foreigners, with Chinese, Hong Kong and Filpino citizens among the dead, while Singapore and Taiwan reported that some of their citizens were injured. The area, which is at a major traffic intersection flanked by five-star hotels and upscale shopping malls, remained cordoned off early Tuesday as police tightened security, with hundreds of schools closed and checkpoints thrown up across the city. As dawn broke police bomb experts photographed the blast site scouring for clues, an AFP reporter at the scene said. The bomb was detonated at about 6:30 pm (1130 GMT) in the middle of the city's rush hour, sending a fireball into the sky as commuters and tourists fled in panic. 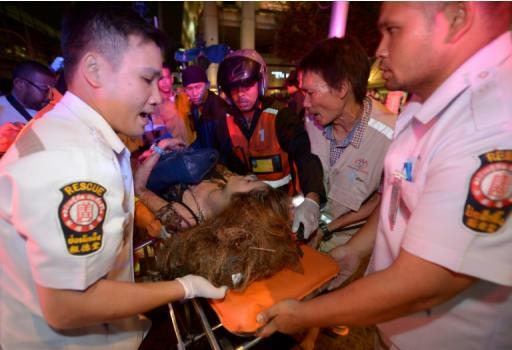 "I heard a very loud bang, it made the whole building shake so I ran outside to see what had happened," Panupan Chansing, 20, a hotel worker at the nearby Grand Hyatt Erawan, told AFP late Monday. "I saw bodies lying on the ground and I saw vehicles on fire. I feel very sad and sorry that this has happened to Thai people... I'm scared." Bangkok has endured years of deadly political violence, with a military junta now ruling the nation, and a decades-long Muslim insurgency in the far south that has claimed thousands of lives. Government spokesman Werachon Sukhondhapatipak told reporters, "It's too early to link the bomb to terrorist attack because no group has come to claim responsibility so far." Junta officials said the attack was aimed at damaging the country's tourist industry, which is a rare bright spot in an otherwise gloomy economy, but it remains unclear who stands to gain from an attack of this scale. Islamic militants have carried out many attacks in other parts of Southeast Asia, including on Indonesia's holiday island of Bali in 2002 that killed 202 people. But they have not made Thailand a prime target, and Sukhondhapatipak said that the style of bomb was not similar to those used by insurgents in the south. The Erawan is an enormously popular shrine to the Hindu god Brahma but is visited by thousands of Buddhist devotees every day. Built in 1956, it is one of the Thai capital's top tourist attractions. A foot wide crater marked the site of the bomb just inside the gates to the shrine, which is in the central Chidlom district close to the famous Sukhmuvit Road shopping strip. "He expresses his condolences to the bereaved families and to the people and government of Thailand," the statement said. "He hopes that those responsible will be brought to justice." The US government released a statement warning its citizens to avoid the area, while also voicing sympathy for the victims. Although there was no immediate claim of responsibility, the initial comments by Thai police and military cast immediate focus on the kingdom's rival political factions. Thailand has been seared by a near-decade of political violence that has left the country deeply divided and seen repeated rounds of deadly street protests and bombings -- but none on Monday's scale. Many observers had predicted a fresh round of violence after the military seized power in a coup in May last year, toppling a civilian government led by Yingluck Shinawatra. Self-exiled former premier Thaksin Shinawatra, who is Yingluck's brother and who was toppled by a 2006 coup, sits at the heart of the political divide. Parties led by him, his sister or supporters have won every election since 2001 thanks to the votes of the rural north and northeast. But he is loathed by the Bangkok-based royalist elite. Thailand is also fighting a festering insurgency in its southernmost Muslim-majority provinces that border Malaysia. More than 6,400 people -- mostly civilians -- have been killed there. In the so-called "Deep South", bombs are a near-daily reality alongside shootings and ambushes of security forces. Civilians are overwhelmingly the target. But the conflict, which sees local rebels calling for greater autonomy from the Thai state, has stayed highly localised. There has never been a confirmed attack by the insurgents outside the southern region despite the years of war.